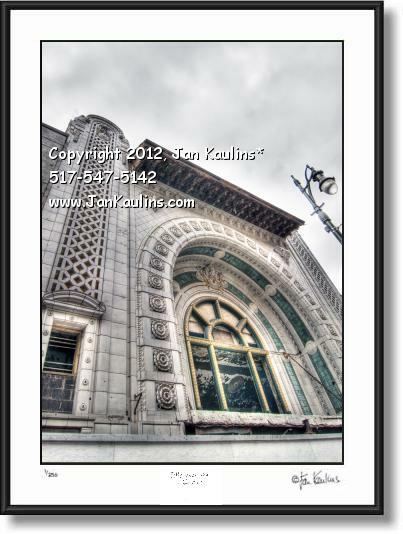 NATIONAL THEATER DETROIT photo picture art print photograph for sale. This DETROIT NATIONAL THEATER photo picture prints for sale is of the remaining architectural façade of this Egyptian style theater designed by noted Detroit area Industrial Architect Albert Kahn. The detail work of the OLD DETROIT NATIONAL THEATER is shown in this artistic visual image by noted Detroit area artist/photographer Mr. Jan Kaulins. This is an original Multiple Exposure High Dynamic Range color photograph created by nationally recognized artist/photographer Jan Kaulins. It is one of the newest artistic images in his most recent series of photographs. Each photograph has been created from nine separate photographic digital exposures and then layered together into one photographic image. It is then ‘tone-mapped’ where individual areas of the photo, as well as contrast, saturation and other qualities of the image can be artistically manipulated to bring out the artistic effects that make these photos so visually unique. Some of the photos in this series are even further enhanced for artistic effect giving them an almost painterly or graphic silkscreened look. They do not look like your grandmothers traditional photos. This is a relatively new photography technique which uses the blending of the nine multiple bracketed exposures to capture and emulate the way that light levels in the real world vary over an enormous tonal range, from the brightest area of sunlight to the darkest area in the shadows. All of these varying degrees of light cannot be exposed properly and captured in a single photograph---hence the necessity of layering and combining of the multiple over and under exposures to allow the viewer to see all of the existing areas of light at one time in one photo. The enhanced saturation, softness, and color of the multiple images also is a partial result of this very unique photographic process and can be quite stunning and dramatic. To see the MANY OTHER PHOTOS FOR SALE in the other Jan Kaulins Photo Galleries on this website click here to return to my Homepage and then go into the many sub-Galleries. The quality of the Jan Kaulins' photographic prints is much higher than we can show within limits of this web site. Slight tonal changes and blurring around the areas of strong contrast are a result of the JPEG compression process, and are not part of the high quality originals. Copyright © 2002 Jan Kaulins. - All rights reserved. and are protected under United States and International copyright laws. without the written permission of Jan Kaulins.